Kia Motors Corporation (KMC) was founded in 1944 and today, as part of the Hyundai-Kia Automotive Group, it aims to become one of the world’s premier automotive brands. 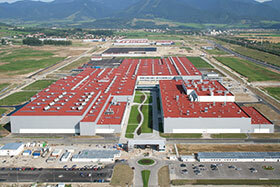 To increase market share not only in Europe, but also globally, KMC built its first-ever European facility in Zilina, Slovakia, which started production with a capacity of 300 000 units per year. As in most automotive companies, optimised manufacturing processes have become more important than ever before. To maximise efficiency and productivity, KMS required an integrated solution where information and devices are connected seamlessly to each other. The Body Shop was operating with CompactLogix connected with ControlLogix and its Body Complete (BC) line was assembling all moving parts through manual handling by 20 workers. However, frequent breakdowns not only decreased productivity, but sometimes stopped the entire production line. The BC line was configured with safety relays and was guarded with safety scanners and relays. The safety relays had complicated wiring and long conductor routing from the safety device to the relay in the main cabinet, without having a by-pass function from the scanners. The safety circuits caused many line stops and it was often difficult to identify the reason or the location of the failure, while also taking a long time to repair. Future line stops were always anticipated due to the long and complicated safety wiring circuits. Relay-based safety controls have a long history of helping prevent hazardous encounters between worker and machine. Safety devices such as scanners and emergency stop push-buttons connected by safety relays, have traditionally been the method of choice to protect machine operators. But relays can offer limited fault diagnostics and are difficult to adapt as applications change because of the hardwiring they require. For these reasons, and considering the critical situation, an alternative integrated safety solution offering status visualisation and higher reliability and flexibility than the incumbent relay system was required by KMS. Seeking a solution to meet its needs for an integrated safety solution with visualisation and increased reliability, KMS turned to Rockwell Automation – a trusted supplier for many of its production operations. Rockwell Automation proposed a safety system that comprised safety-related programmable controllers and a network. Safety controllers, instead of traditional safety relays, help customers to create both lean and quick adaptable manufacturing processes that keep operators safe. The Allen-Bradley GuardLogix safety controller, which expands on standard Allen-Bradley ControlLogix processors with safety firmware and a safety processor was offered. Remote safety I/O modules were added and connected to the EtherNet I/P network and visualisation of safety conditions, alarms, emergency events and programming of control system and visualisation was developed for the existing Allen-Bradley PanelView Plus panel. Allen-Bradley GuardLogix brings together the benefit of a Logix platform – common programming environment, common networks and common control engine – with integrated safety control in an easy-to-use platform, while providing SIL 3 control. By deploying Allen-Bradley ControlLogix processor, GuardLogix users can benefit from common programming software, controller and I/O to help reduce development time and application cost. With the new design, the line was divided into five zones. Each zone had a cabinet with Safety Point I/O and only 2–3 m of wiring. Each Safety Point I/O was connected to Allen-Bradley GuardLogix with EtherNet I/P using RSLogix 5000. Each scanner had a bypass function with the possibility of light signalling and switching. Now, when the line is interrupted, only the relevant zone is stopped, signalling the location. The operator can also easily communicate with each zone through EtherNet I/P, allowing the failure to be easily identified and quickly recovered, while other zones remain operational. KMS considers the Rockwell Automation solution a complete success. By converting to a Safety PLC from a relay-based solution, it now has a flexible line with excellent reliability, which reduces maintenance and troubleshooting, while helping to secure safety as required. KMS now plans to expand and apply the integrated safety concept to other lines in the body and press shops.